Friday, August 21 1908 -- The local Republican political convention is over, and now it's time for the Dems to have their go. 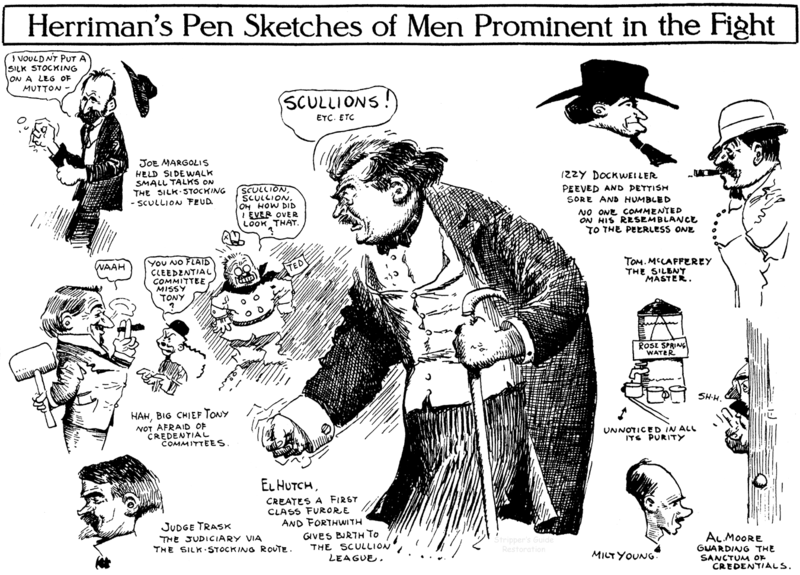 The drama isn't cranked up quite as much, so Herriman mostly just doodles faces, but he does comment on the divide between the Dems who represent well-to-do precincts (the silk stocking league) and the more impoverished sections (the scullion league). Loving the guest appearance by Teddy, who would indeed have enjoyed adding the term 'scullion' to his political lexicon. The political conventions were something special for the 'toonists. All the big papers had their artists there. Sketching away. Connie, March 28 1937, courtesy of Cole Johnson. How did Prof. Borgg get the Native to kow-tow and call him Master and all?! Prof. Borgg is surely a baddy. Cool apparatus in the lab. My father was an electrical engineer and loved to see all of the scientific stuff in Monster movies....bubbling and sparking... me too! Does anyone know the range of dates for the Connie scifi stories? I've only got a few Connie Sundays and some are of her on an archaeological dig in presumably South America with what look like Aztecs in the story. Is this story line considered scifi? Greg, I'd say the SF stories start August 2, 1936 when the time machine is first introduced and Connie goes into the future. They're still going in November 1940, though not everyone in between is really SF. They are all adventure strips and not the one off humor strips from before. At least as far as I've seen. How did Prof. Borgg load all his lab equipment and vamoose so quickly? With the help of one flunky he can load tons? Joakim Gunnarsson last year on his blog posted the version of a portion of this Connie storyline that appeared in Famous Funnies #93. Nice chance to see how comic books adapted strips during the era when that was their bread and butter. Interesting point. I scanned the entire issue of Famous Funnies #93 for the Digital Comics Museum earlier this year! I've got a large collection of Famous Funnies and many of the Connie scifi stories in those. I never saw any of the time travel stories in FF though from what I can recall. Maybe I'm wrong on that point though. Hershfield was born in Cedar Rapids, Iowa, but soon moved to Chicago, where he attended school. A few months’ study at the Chicago School of Illustration provided him with all the art training he ever had. According to the 1900 U.S. Federal Census, Hershfield’s family was in Chicago, Illinois. He was the fourth child of Mikel and Annie, both Russian emigrants, and his birth was recorded as “Oct 1885”. The household included eight children and was located at 293 West 12 Street. The Chicago School of Illustration was operated by Frank Holme. Hershfield’s teacher may have been Holme, Joe Carll or John T. McCutcheon. …After completing high school, he went to work for The Chicago Daily News for $2.50 a week to draw pictures of news events. In 1902, when he graduated to being a cartoonist, he presided at a farewell banquet for another newspaper artist. From that point on he had a steadily growing diet of chicken and a widening audience to go with his developing repertory of jokes. …[he] progressed from copy boy to cameraman, reporter, and finally sports cartoonist. During that time the comic artist began to experiment with a strip called Homeless Hector, telling of the difficulties of a lost dog. American Newspaper Comics (2012) said Homeless Hector ran from January 4, 1906 to October 20, 1908. 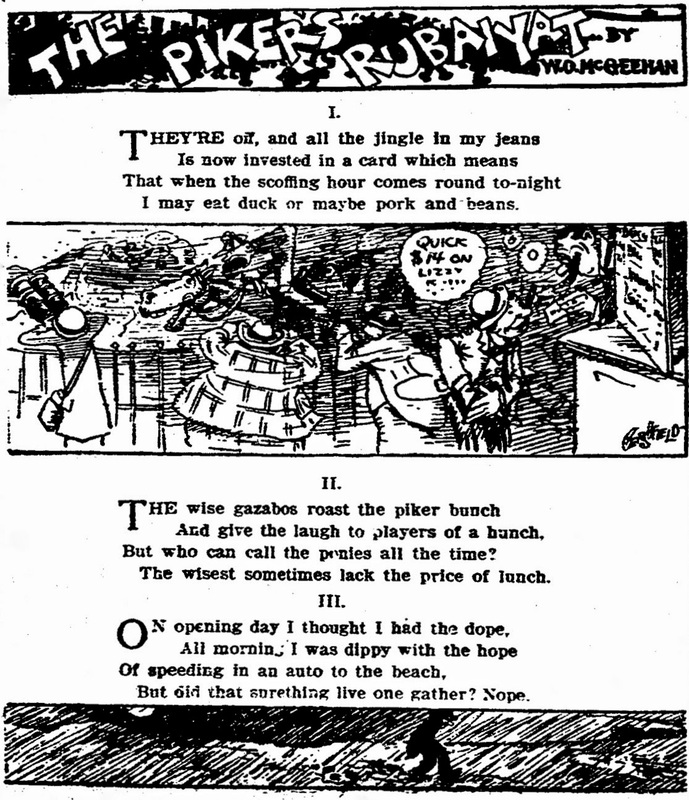 The strip returned and was syndicated by National News Association from July 22 to December 3, 1912. Waugh provided some details about Hershfield’s work and employer. According to American Newspaper Comics, Hershfield’s Chicago Daily News strips include: War’s Ebb and Flow from January 3 to February 14, 1906; Bill Slowguy from February 8, 1906 to October 19, 1908; Adventures of a Fly from November 4 to December 3, 1907; Christopher’s Luck from October 16 to December 23, 1907; Tiny Tinkles from January 7 to 16, and February 11 to 20, 1908; The Luck of Christopher from February 18 to June 2, 1908; and The Fortune Teller from April 15 to September 16, 1908. In 1905 Hershfield also filled in for some of C.F. Batchelder’s panel cartoons. The San Francisco Chronicle, February 24, 1929, explained how Hershfield helped Robert Ripley’s career. Luck began to shoot at him [Ripley] as soon as he got to the Bulletin office. He lost his job. That was the lucky part of it—because he immediately got a better job across the street with The Chronicle. Harry Hershfield was the star cartoonist of that paper and was busy illustrating a series [probably The Piker’s Rubaiyat] for W.O. McGeehan. Mr. Hershfield preferred to do sporting pictures and persuaded Harry B. Smith, the sports editor, to put the newcomer on trial doing McGeehan’s stuff. 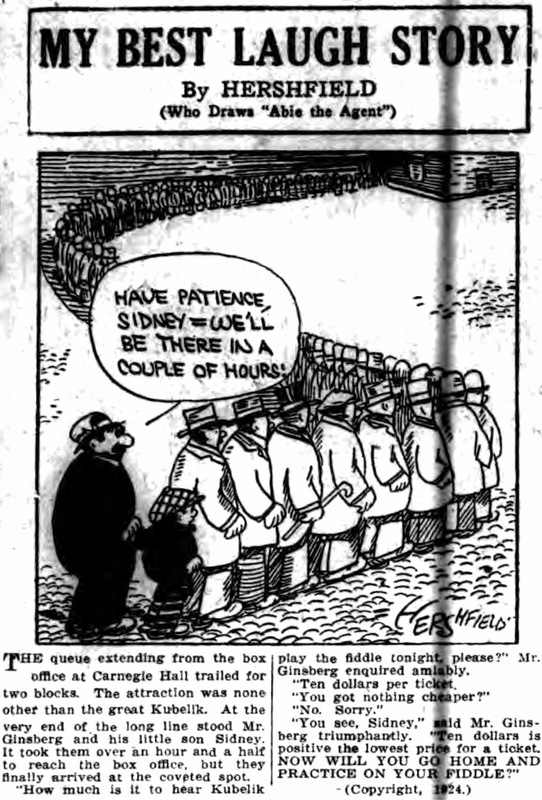 Hershfield once asked Brisbane if he considered a cartoonist a newspaperman. “Would you call a barnacle a ship?” was the reply. Brisbane, however, aware of cartoonists’ ability to attract readers, once cut off their signatures in order to reduce their personal following and thereby their salary demands. Hershfield took the issue directly to Hearst, who not only restored the signatures but ordered bylines as well. This credit has become standard practice since. Abie Kabibble was a middle-class businessman and paterfamilias, a role with which more and more Americans could identify. Although minorities had been fair game for satire in the past, a cast of Jewish characters using dialect was a touchy endeavor. That Hershfield was able to make their qualities and traits universal is a tribute to his skill, gentle wit, and humanity. The couple was in the 1915 New York State Census; residing at 109 West 45th Street in Manhattan, where Hershfield was a cartoonist. Hershfield signed his World War I draft card September 12, 1918. His address was 620 West 149 Street in Manhattan. The cartoonist worked at the New York Evening Journal. He was described as medium height and build with blue eyes and light-colored hair. 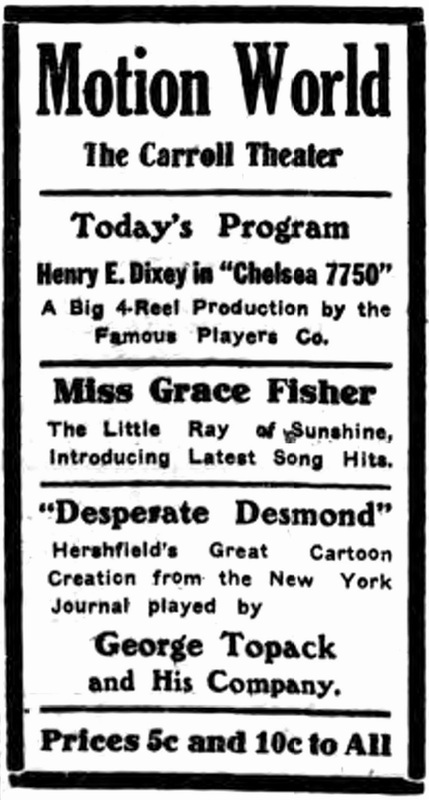 The New York Dramatic Mirror, May 27, 1919, published a story on how Hershfield entered vaudeville. Harry Hershfield has escaped being a ham. Mr. Armour and Mr. Swift, there is just so much less pork for you to sell. Why? Read on. Harry is known by his cartoons, accompanied by the nom-de-plume Abie, the Agent, throughout Manhattan and the provincial press. He has attempted and succeeded as a monologist. The 1920 census said Hershfield was at the same address found on his draft card and did newspaper work. 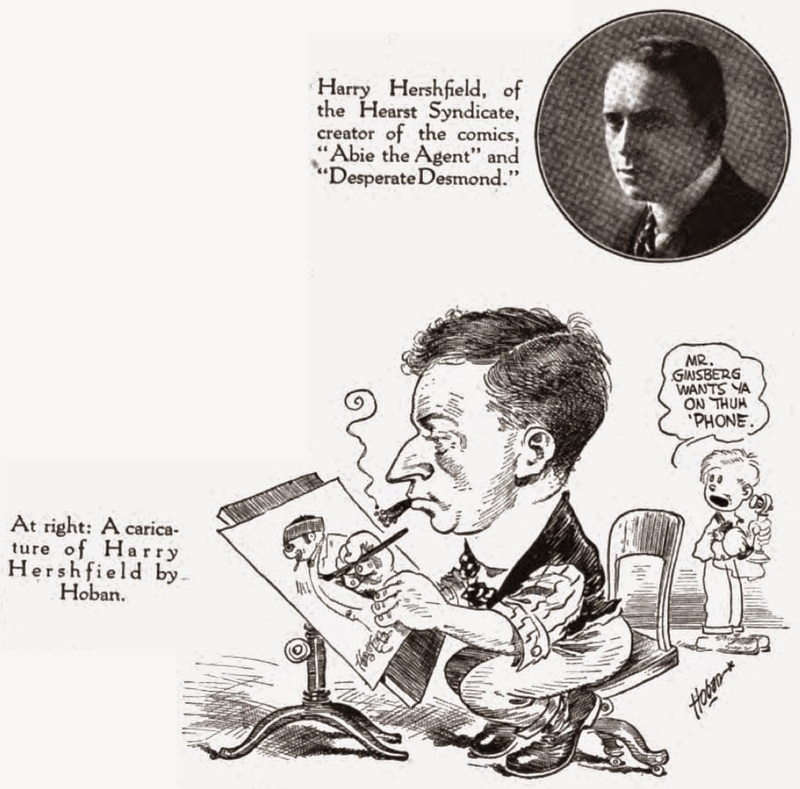 In the 1925 New York State Census, cartoonist Hershfield resided at 454 Riverside Drive in Manhattan. Hershfield’s residence, in the 1930 census, was in Manhattan at 251-257 West 104th Street. 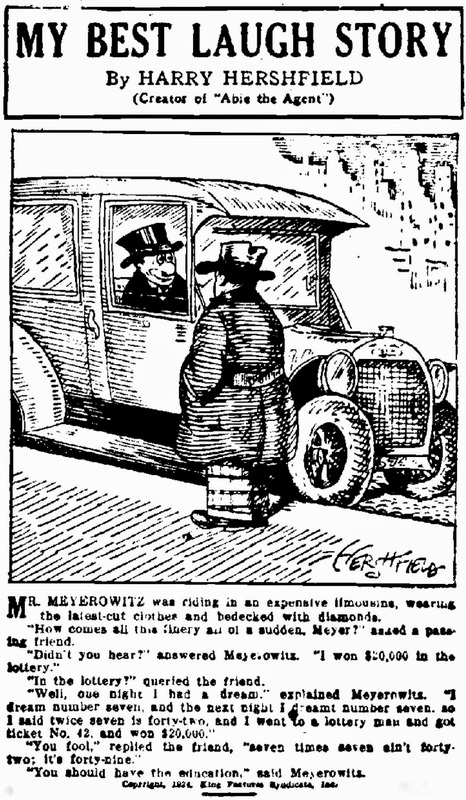 When Hershfield left the Hearst organization because of a contract dispute, he created Meyer the Buyer which appeared in the Evening Graphic from February 15 to May 9, 1932. 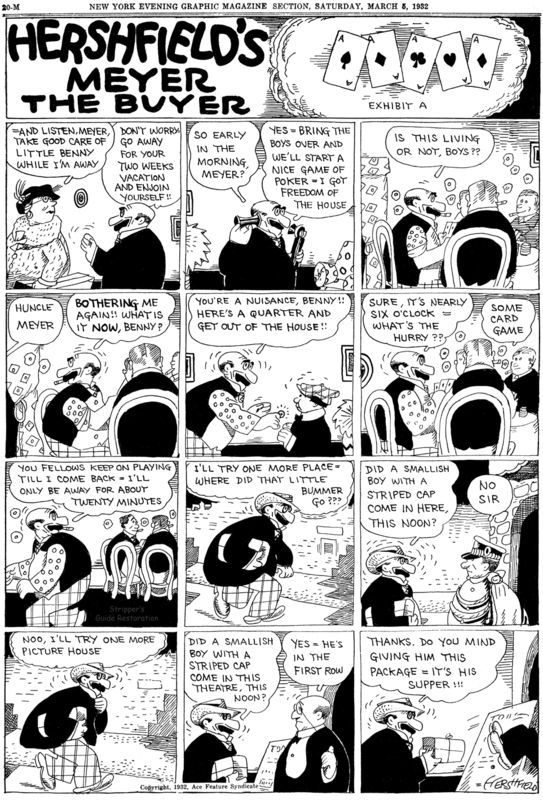 About two years later, his strip According to Hoyle ran in the New York Herald-Tribune. The New York Times, February 16, 1934, reported Hershfield’s bankruptcy filing with liabilities of $16,289. On April 27, 1942 Hershfield signed his World War II draft card which had the same address in the 1940 census. He had an office at the Daily Mirror newspaper. He stood five feet seven-and-a-half inches and weighed 152 pounds. He had blue eyes and gray hair. On July 2, 1945, Hershfield read the daily newspaper comic strips by invitation of Mayor La Guardia during the newspaper delivery man strike. * The Piker’s Rubaiyat was written by William F. Kirk, of the Milwaukee Sentinel,in 1904. 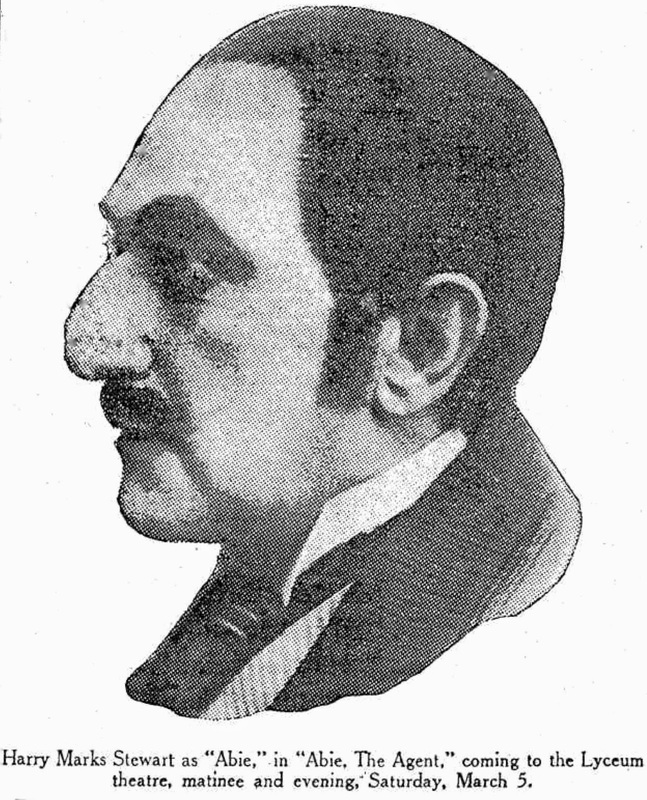 His profile and The PIker’s Rubaiyat were published in the National Magazine, July 1904. William O’Connell McGeehan was inspired by Kirk’s piece and wrote his version for the San Francisco Chronicle. Hershfield also did a humorous text panel called Kabibble Kabaret, which ran daily (except Sunday) from 1915 until 1929. In the early years it was written in poetic form, but in the later years it became more like a tongue-in-cheek "advice" column, with "questions" being sent in by readers. I have no idea if any of the questions were legit; I'm guessing they were all imagined by Hershfield. An example from 1927: "Dear Mr. Kabibble, how will I know when the right man comes along?" - Miss X. "He'll keep on going!" I should have said "at least" until 1929 - that's the latest I've seen, but it may have run longer. Harry Hershfield, the creator of the popular Abie the Agent comic strip, had a disagreement with the Hearst people over his contract in 1931, and he jumped ship. While Hearst could have had a new artist take over the strip, he chose not to. Whether that is a reflection of the somewhat flagging sales of the Abie strip I don't know, but the concept of a Jewish character headlining a comic strip definitely seemed to hold a lot of interest to other newspaper publishers. I'm guessing that had to do with the large Jewish population in New York, and Hershfield's name recognition. 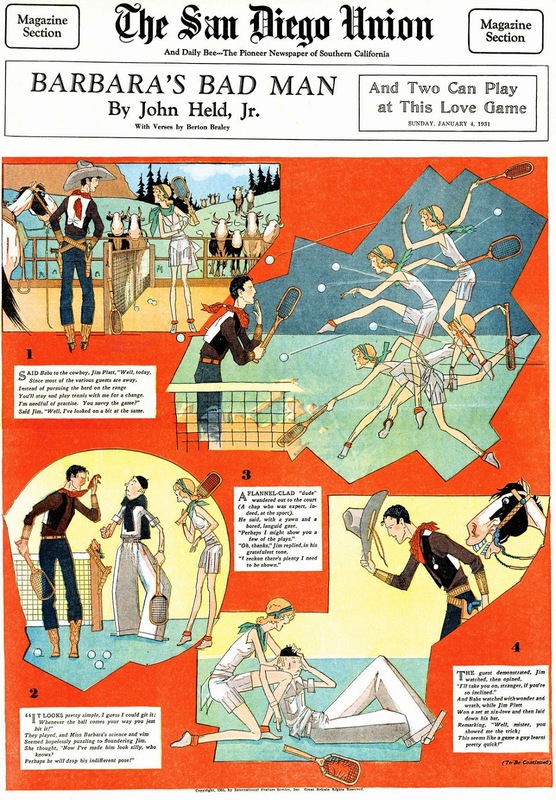 As soon as Hershfield walked away from Hearst, he accepted a berth doing a very similar strip, Meyer the Buyer, for a concern called Ace Feature Syndicate. According to Hershfield in Martin Sheridan's Comics and their Creators, "during that time I had an offer to draw for the now defunct MacFadden publication, New York Graphic. It was a fabulous salary that I refused. As they didn't intend to pay it, they could afford to be extravagant." The problem with that statement is that it appears as if Ace Feature Service was just a covert name for MacFadden, as the only paper I've found that ran Meyer the Buyer was, in fact, the New York Evening Graphic. Although Hershfield is a little foggy on who he worked for, it certainly seems he may remember correctly about MacFadden's inability to pay. Meyer the Buyer first appeared in the Evening Graphic on February 15 1932, and ended less than three months later, on May 9. Was the short run of the feature a result of MacFadden not coming through with a promised salary? Meyer the Buyer was very similar to Abie the Agent, except that where Abie was a car salesman, Meyer worked as a buyer -- what we call these days a purchasing agent. The two characters looked very similar, except that Meyer's moustache is a black smudge rather than a series of vertical lines. Both spoke in a stereotypical Jewish dialect sprinkled with Yiddishisms. Although the strip had no time to catch on in the Graphic, evidently Hershfield wasn't done with the character when he left, as a short-lived radio show about the character began in August. After Hershfield's adventure with MacFadden, he took some time off from the comic strip life and pursued other entertainment avenues -- not hard for Hershfield, as he was a multi-talented performer. In 1934 he came back to strips with According to Hoyle in the New York Herald-Tribune. His reappearance in newspapers seems to have rekindled the relationship with Hearst, and it wasn't long before Abie the Agent was resurrected for a final five year run. Oops. Forgot to mention that in the post. It was a Saturday only strip (the Graphic had no Sunday edition). Meyer the Buyer was also a short-lived radio program in 1932. Alan Freed was on it. I believe it was broadcast from New York City and am trying to learn what radio station produced it. I have a hunch it was WOR, but would like to know for sure. Hearst's International Feature Service offered up Barbara's Bad Man, which ran from November 23 1930 to February 22 1931 on newspaper Sunday magazine covers. Between the glorious art of John Held, Jr. and the finely spun verses of Berton Braley, it was one of the more entertaining magazine cover series, in my opinion. Of course the storyline was the typical goofy love story, but so well done that you can forgive the creaky, but seemingly required, magazine cover series plot. 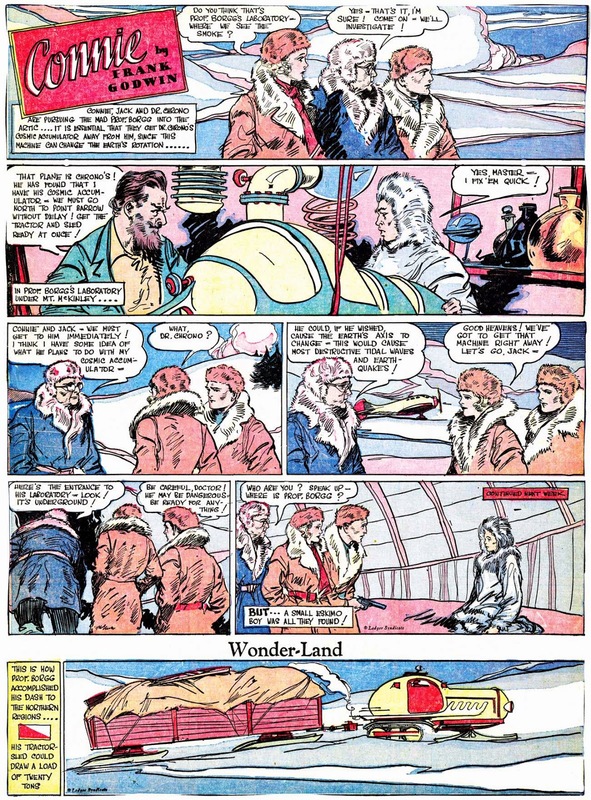 I was wondering if you know of any adventure strips that may be public domain? 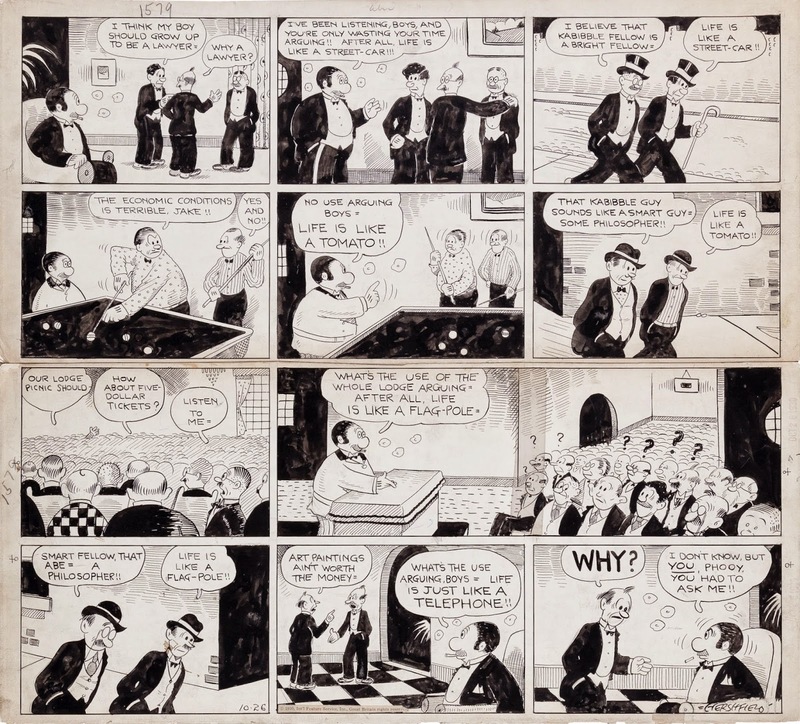 Many, if not all, years of Hairbreadth Harry (1906-40), the first adventure strip are PD. The three syndicates that handled it, Philadelphia Press, McClure, and the Ledger Syndicate are all long gone, and the trade mark (which was given to me) expired years ago. Okay, Mark, you can't just mention that the trademark for Hairbreadth Harry was given to you, and not give with the story behind that statement. 'Fess up or I'll tell Disney you once thought about reprinting a Mickey Mouse daily without permission. Wouldn't many of the old strips be PD now? Like Smokey Stover or Happy Hooligan? Have you ever looked into this? I really like the work of Foster M. Follett, so much so that I devoted a week to him on the blog back in October 2012. Luckily, though, that didn't empty the coffers of Follett gems. 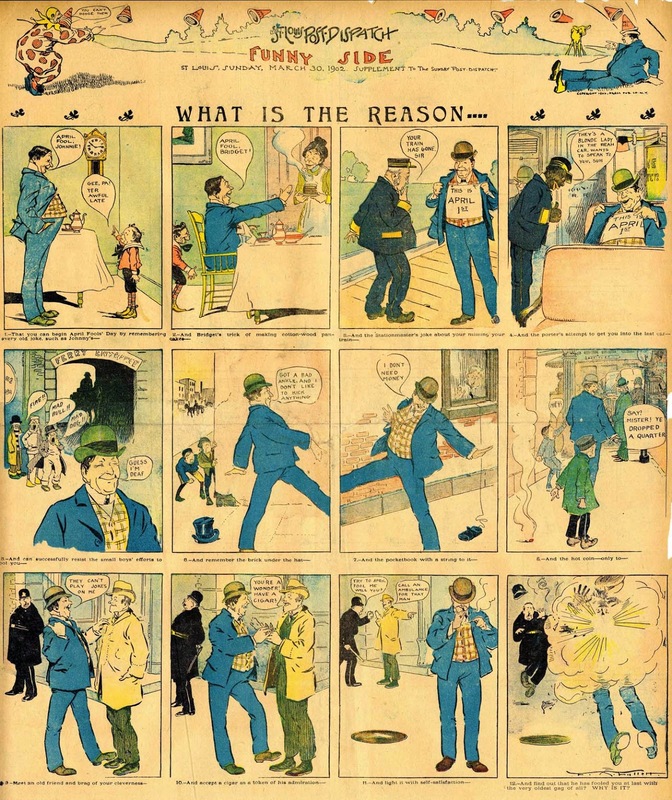 Here's his debut series in the New York World's Funny Side section, a delightful one titled What is the Reason. Just in case you thought Jimmy Hatlo was covering new ground in They'll Do It Every Time, this is a very early precursor to the theme -- poor innocent nebbishes beset by the trials and tribulations of a harsh, unfeeling, and arbitrary world. Pity them! Thanks to Cole Johnson for the samples! When did color comics start? The post 1900 papers I've looked at online are black and white (or not microfilmed in color?). 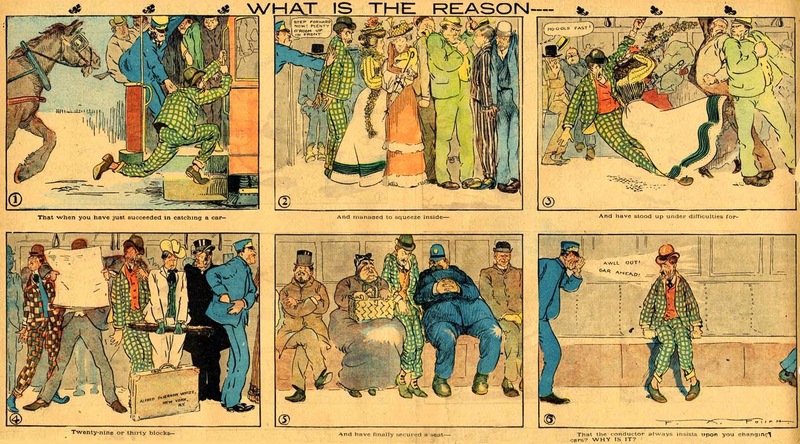 The first newspaper color comics were in 1893. The online newspapers you're viewing are taken from black and white microfilm. ~ Had to cut that one out! 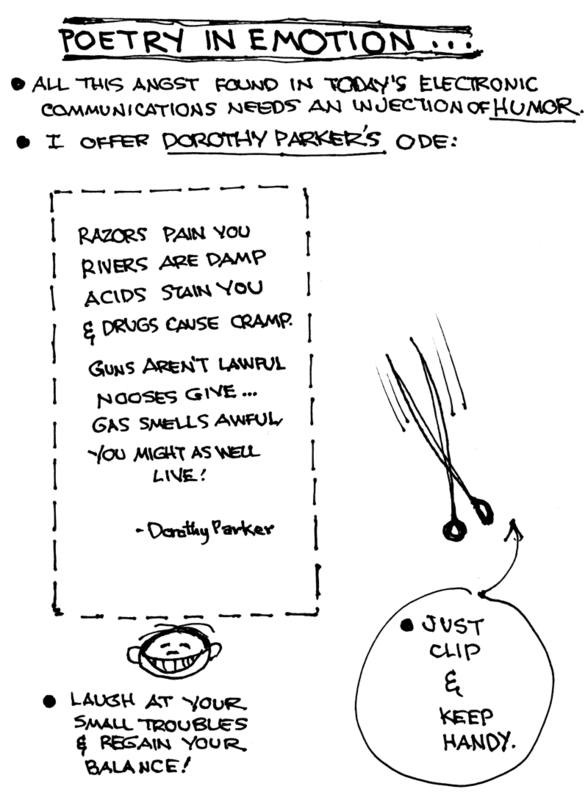 Miss Parker in her prime was a force of nature.